This is the pensioner who is accused of wielding a knife at a man and who is to go on trial charged with wounding. At Craigavon Magistrates Court today (Friday), 69-year-old Russell Hanna was charged with wounding a man with intent to cause him grievous bodily harm on 18 December last year. Hanna, from Derrytrasna Lane, had originally been accused of attempted murder arising from the incident close to his home. 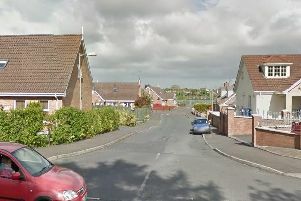 The charge arises from an incident at Derrytrasna Lane in Derrytrasna when the victim was stabbed in the neck, face and abdomen, allegedly with a Stanley knife. Appealing for information and witnesses to come forward, a police spokesperson said at the time that although hurt, the victim’s injuries were not believed to be life threatening. In court today (Friday), a prosecuting lawyer submitted there was a Prima Facie case against the pensioner, a submission which defence solicitor Peter Murphy took no issue with. Hanna was told he had the right to comment on the charge or give evidence to the Preliminary Enquiry, the legal step necessary to refer a case upwards to the Crown Court, but he declined the opportunity. Freeing Hanna on continuing bail, District Judge Bernie Kelly ordered him to appear for his arraignment at Craigavon Crown Court on 28 June.